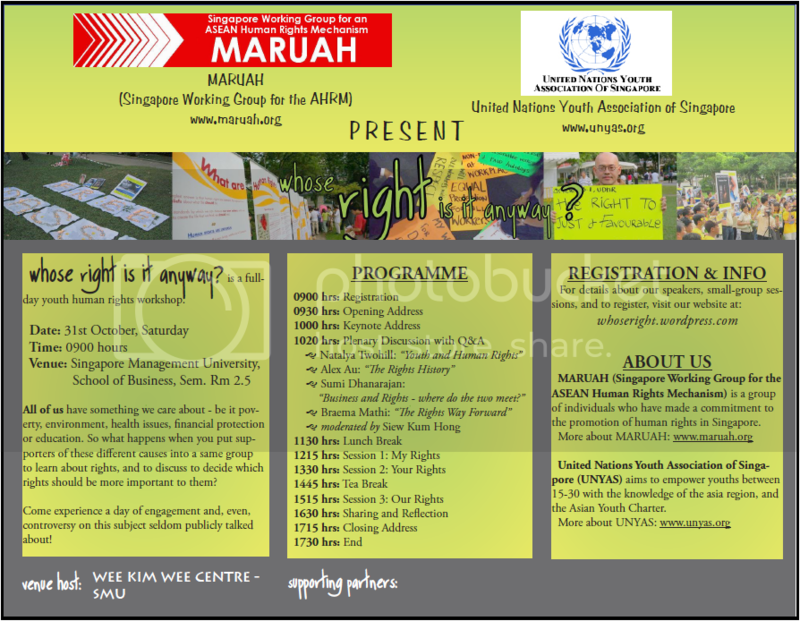 MARUAH, a local human rights advocacy group, is organising a youth human rights workshop together with UNYAS on the 31st October 2009, 9.00am to 5.30pm at the Singapore Management University. Entitled ‘whose Right is it anyway?’, some of you might be interested in attending this workshop. This workshop aims to raise awareness about human rights and sensitise young people to the everyday human rights issues surrounding them, and would feature well-known speakers along with specially designed small-group sessions to engage in human rights. – Learn more about the basics of human rights and what it can mean to you. – Taking the step forward to get involved in the rights discussion that is slowly gaining momentum in our country. – Get the opportunity to meet other youths who come to the event with diverse point of views. Registration is required for this event. You can find out more about the event here: http://maruah.org/2009/10/08/yhrw/ or see the e-flyer below for details.